A letter from House Republican Leader John Boehner. 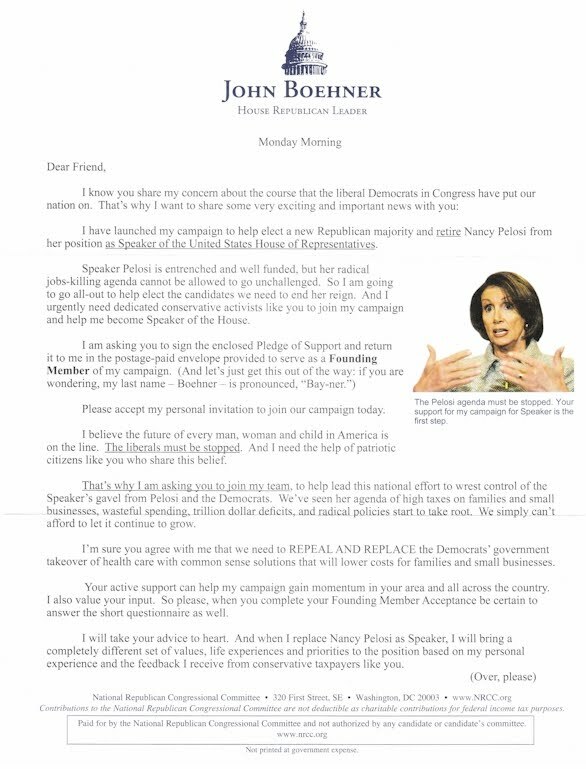 The envelope states that Boehner has important news that will end Nancy Pelosi's "reign" as Speaker, making Pelosi sound like some kind of dictator or totalitarian ruler and less like some majority elected government official. It is interesting that Boehner seems to avoid calling his party the minority party, despite that being exactly what it is. 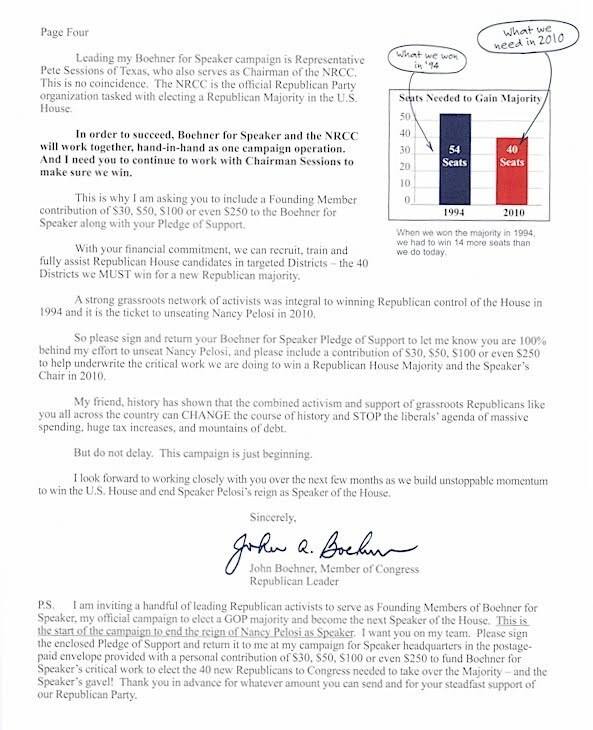 This letter from Boehner is nothing more then a plea for donations and a push poll trying to guage the Republican mindset. I have decided to include the letter in it's entirity for all those to see - not just Republicans. Let's disect this document page by page! Like any good story, Boehner begins by defining the enemy, and in this case, the "liberal" Democrats in Congress, and in particular, Nancy Pelosi. According to Boehner, Pelosi is a well funded radical who made it her agenda to kill jobs. It is this reason why he is announcing his campaign to become Speaker of the House. Enclosed in the letter was a "Pledge of Support" push poll, which asks for some money and answers to some obviously weighted questions (I will get to them later). Since they enclosed a postage-paid envelope, I plan on returning their poll with some of my thoughts so their money isn't entirely wasted. Boehner makes the argument that "liberals must be stopped" and that he needs the support of "patriotic citizens" like myself, implying that those who support Pelosi are not patriotic. Boehner outlines her "jobs-killing agenda" as establishing "high taxes on families and small businesses, wasteful spending, trillion dollar deficits, and radical policies." This claim is interesting considering reports that 47% of Americans don't pay federal income tax, and most people don't realize that they had gotten a tax cut under the current administration because of the misleading statements made by people like Boehner. Jake Simpson of The Atlantic Wire also points out that the reason why the number of Americans paying no federal income taxes are so high is because of the Earned Income Tax Credit - a Republican invention. 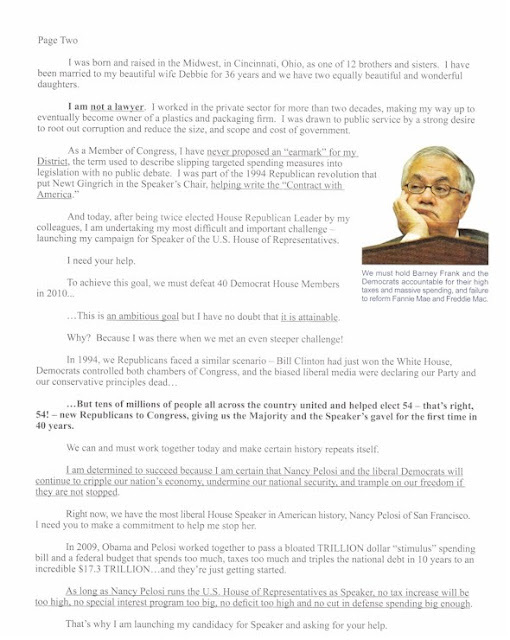 Page two of Boehner's letter begins with his rags to riches story and how much of a family man he is. I wonder if now that Boehner talked so glowingly about his wife and children that he will be hit with the GOP curse - the one where the conservative moralist is caught cheating on his wife, seeks a homosexual relationship in a Minnesota bathroom, or sends provacative and obscene message to underaged congressional page boys. Boehner goes on to mention that he had never proposed an "earmark" in the 18 years he hasbeen in Congress, and as it so happens, that fact checks out. The next part is where I started to scratch my head. Boehner goes on to praise the 1994 Republican takeover of the government and how they faced oposition from Democrats and the liberal media, but the way he writes about it, it sounds as if he is ignoring the fact that a majority of Americans voted against the Republicans for the past four years. Boehner acts like he is going to ride into the House on a white horse, saving the day, but he is just another politician upset that his party is the minority, and he plans to ignore the majority to institute minority rule. Boehner also claims that under Nancy Pelosi and the liberal Democrats, the American economy has been and will be further "crippled," our national security will be "undermined," and our freedoms will be "trample[d]" on. These accusations are funny considering the collapse of the economy was no overnight sensation and was the culmination of years of various events from both parties. The nation is probably more secure now then it was in the past, with the adminsitration refocusing the war in Afghanistan and with border security at record highs. And the last claim is the most ridiculous - Boehner seems to forget The Patriot Act, a bill that he voted in favor of. I also think it is interesting that Boehner references defense spending, implying Pelosi will strip the military of their budget. I guess he is one of those people who like spending money on wasteful projects like the ones Republican Defense Secretary Robert Gates wants the president to veto if included in the defense authorization bill. Page three of the letter is an appeal to the Tea Party, which Boehner calls "grassroots Republicans." He begs for them to "focus [their] resources and energy" to support his campaign. This is where Boehner makes his promises - no new taxes, government transparency, an "all of the above" energy policy, a costly and unproven missile defense system, and a repeal of "Obamacare" with common sense reforms. Apart from the last two points, it sounds like he is riffing on Obama's 2008 presidential campaign. I think his desire to push for "common sense reforms" is interesting considering he has been in Congress for close to two decades and had done nothing to push such reforms in the past. Why should I believe him now? 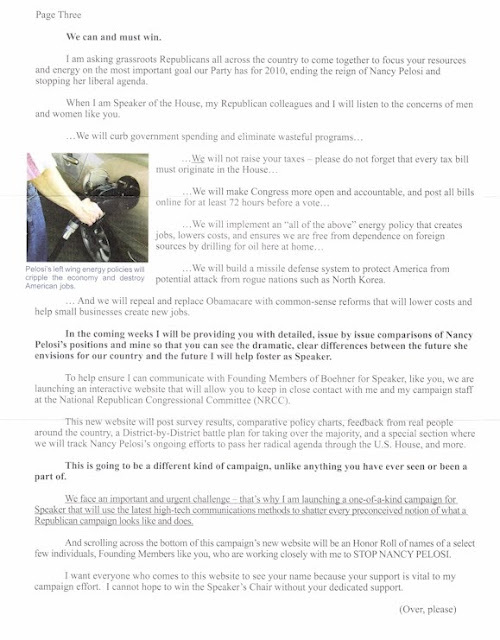 Boehner asks for blind support, stating that he will release comparisons on the issues between himself and Nancy Pelosi. He also plans on initiating an interactive website to coordinate efforts - similar to the taxpayer-funded GOP site recently launched. Boehner states that his website will issue a "district-by-District battle plan for taking over the majority." It's nice to see that Boehner has a great disrespect for the millions of Americans who didn't want Republican rule. What is interesting about this puish poll is that the Republican's have been purging their ranks of any moderate. Look at Florida Governor Charlie Crist - the part preemptively attacked the governor when he was a GOP candidate and threatened all members who may consider future support of an independent campaign. The results they get back from this poll are meaningless because they will only represent the conservative thought. A majority of Americans wanted a public option but the GOP continued to push for it's removal. Republicans have constantly bucked the majority to pass their idea of what America should be. They have constantly ignored the American electorate, so why should I believe Boehner now? 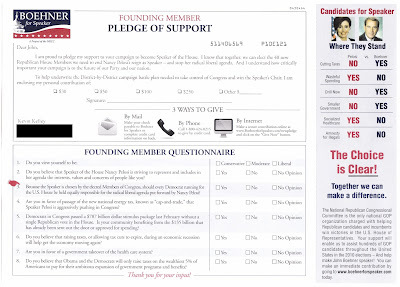 Because National Republican Congressional Committee sent me a letter asking for my money? Limpy wouldn't know the truth if it bit him.